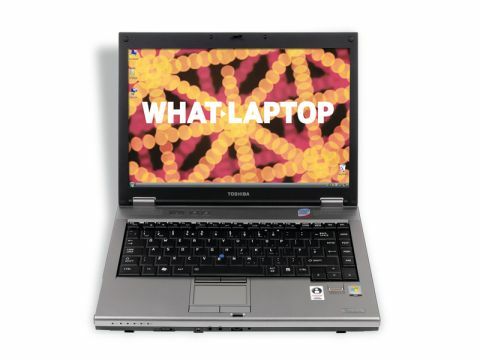 Toshiba's Tecra range is aimed predominantly as business users, with the Tecra M9L-1B7 (£549 inc. VAT) being the semi-portable machine in the range. The design is plain and boxy, but feels reassuringly well made. The black and silver plastic is thick and there is very little ﬂex in the design. The 14.1-inch screen is a great compromise if you need a reasonable-sized screen, but also a degree of portability. We found images looked really good. The smaller size means the weight of the laptop is kept down to a reasonably portable 2.3kg, so you'll be able to carry this machine with you for long periods. When it came to battery life, we managed to get well over four hours from this machine, which is great if you need to work away from mains power for long periods. Perhaps the only downside of the Tecra's size is the slightly cramped keyboard, which we found took a little time to grow accustomed to. On the plus side, the quality is excellent with the square, boxy keys having a great feel to them. There is also a reassuring click as you type, with little or no rattle. Being a business model, you'll ﬁnd a pointing stick as well as the standard touchpad. There are also two sets of mouse buttons. The pointing stick lies ﬂush with the keyboard, so you won't accidentally strike it when typing. Below the right-hand side of the keyboard you'll ﬁnd a biometric scanner, which adds an extra layer of security. In terms of performance, this is a well-speciﬁed laptop for the price. Powered by an Intel Core 2 Duo T5670, we found it ran most tasks with little or no visible lag. Pre-installed with Windows Vista Business Edition and ﬁtted with a mere 1024MB of memory, the minimum needed to run Vista, we'd suggest opting for a memory upgrade whenever possible as you'll see performance improve considerably. That said, we had no real problems when running this laptop and, as long as your needs are fairly standard, it offers great value for money. Being a business machine you won't ﬁnd any cutting-edge features onboard. On the rear of the chassis you'll ﬁnd old legacy ports, VGA-out and Serial port connector, while on the sides there are three USB 2.0 ports and a DVD rewriter. The Toshiba Tecra M9L-1B7 is a good all-round machine aimed at those who need to be mobile for good portions of the day. It won't suit those looking for a multimedia tool; however, if you're looking for a machine to use on the daily commute as well as in the ofﬁce, this is worth considering.